Motorists and rail passengers are being invited to have their say on a major upgrade proposal for Yapton level crossing. If agreed, the plans by Network Rail would see the crossing – which is used by 8,000 vehicles and 300 trains every weekday – upgraded from an automatic half-barrier to a CCTV controlled full-barrier crossing. 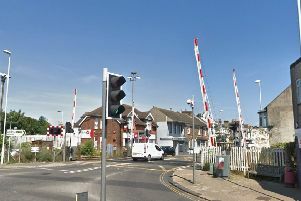 John Halsall, Network Rail South East route managing director, said: “Every day at Yapton level crossing, motorists are ignoring or attempting to beat the warning lights, queuing over the crossing or weaving around barriers as trains approach. This behaviour means that a collision between a vehicle and a train is a real risk. “This upgrade will significantly reduce the risks from dangerous driving and allow trains in the area to run at full line speed, helping to improve train punctuality and reduce delays. In a statement Network Rail said ‘regular misuse’ has seen a number of measures over the years including introducing a speed limit on passing trains in 2012 to installing red light enforcement cameras in 2017 in partnership with the British Transport Police. The latter, it said, has seen ‘hundreds of motorists’ being prosecuted for dangerous driving however an average of 3.7 incidents are said to still occur each day. Inspector Becky Warren, British Transport Police, said: “We will not hesitate to enforce the law, but convincing people to change their habits at crossings is a vital part of what we do. Network Rail said the continued issues are the reason it is bringing forward the crossing upgrade, which it said ‘would have been required by 2025 as a result of local population and traffic growth’. A public meeting will be held at Yapton Village Hall on April 24 from 7pm to 8pm to give crossing users the opportunity to hear more about the upgrade and its impact on road and rail traffic.